Restore >> Library >> "Shiloh" ..
"It would be well for us to spend a thoughtful hour each day in contemplation of the life of Christ. We should take it point by point, and let the imagination grasp each scene, especially the closing ones." As Jesus passed the gate of Pilate's court, the cross which had been prepared for Barabbas was laid upon His bruised and bleeding shoulders. Two companions of Barabbas were to suffer death at the same time with Jesus, and upon them also crosses were placed. The Saviour's burden was too heavy for Him in His weak and suffering condition. Since the Passover supper with His disciples, He had taken neither food nor drink. He had agonized in the garden of Gethsemane in conflict with satanic agencies. He had endured the anguish of the betrayal, and had seen His disciples forsake Him and flee. He had been taken to Annas, then to Caiaphas, and then to Pilate. From Pilate He had been sent to Herod, then sent again to Pilate. From insult to renewed insult, from mockery to mockery, twice tortured by the scourge,--all that night there had been scene after scene of a character to try the soul of man to the uttermost. Christ had not failed. He had spoken no word but that tended to glorify God. All through the disgraceful farce of a trial He had borne Himself with firmness and dignity. But when after the second scourging the cross was laid upon Him, human nature could bear no more. He fell fainting beneath the burden. This was the only thing that attracted Christ's attention. Although full of suffering, while bearing the sins of the world, He was not indifferent to the expression of grief. He looked upon these women with tender compassion. They were not believers in Him; He knew that they were not lamenting Him as one sent from God, but were moved by feelings of human pity. He did not despise their sympathy, but it awakened in His heart a deeper sympathy for them. "Daughters of Jerusalem," He said, "weep not for Me, but weep for yourselves, and for your children." From the scene before Him, Christ looked forward to the time of Jerusalem's destruction. In that terrible scene, many of those who were now weeping for Him were to perish with their children. Christ gave Himself for our sins. He suffered the cruel death of the cross, bore for us the burden of guilt, that He might reveal to us His love, and draw us to Himself. As we accept this gift, Christ through the touch of love will inspire hope in the hopeless and bring the peace of heaven to the sin-stricken heart. We are saved through His sacrifice that God through us might be made known to the world. As we look upon Calvary and see the suffering form of Christ, we begin to realize that He endured such shame that we might receive the touch of love. As we are drawn to Him, He is willing to forgive us. Why not accept the gift of His love today and receive the offer of His salvation? Had they known that they were putting to torture One who had come to save the sinful race from eternal ruin, they would have been seized with remorse and horror. But their ignorance did not remove their guilt; for it was their privilege to know and accept Jesus as their Saviour. Some of them would yet see their sin, and repent, and be converted. Some by their impenitence would make it an impossibility for the prayer of Christ to be answered for them. Yet, just the same, God's purpose was reaching its fulfillment. Jesus was earning the right to become the advocate of men in the Father's presence. To those who receive God's forgiveness, He offers to instruct and teach them how to live that they may enjoy the security and peace that passeth understanding. As we pass through the difficulties and uncertainties that life can sometimes bring, we are comforted and strengthened through knowing that someone has travelled this road before. God promises to lead the way, to watch over us, to keep us in His sight at all times, for He is the One who sees the end from the beginning. Because of the complexities of life and the innumerable dangers that beset us, mankind longs to be safe and secure. Why not place yourself into God's care, and allow Him to direct the way? It will bring into your possession the very best that life can offer. "I will guide thee with mine eye," He says. Today, in life's varying round--put your trust in the "look of love." It was God who created this world and everything that is therein. Love is the pre-eminent attribute of the Creator in respect to His creatures. It is the controlling power in divine government. For "God is Love." However, man refused to be governed by this principle and the world as we know it is the result of his rebellion. Love is genuine only when it is in action. There are no limits to the love of God; there are none to whom the benefits of this love is not available. God is the source of all life; you can trust in Him. There is but one condition to receive the benefits of Calvary--belief in, and a willing co-operation with Christ. If this is your desire, then lose no time, for these moments are golden. As you draw near to HIm, He will draw near to you with mercy and forgiveness. Roll all your burdens upon Him. I say unto thee today, Thou shalt be with Me in Paradise. Christ did not promise that the thief should be with Him in Paradise that day. He Himself did not go that day to Paradise. He slept in the tomb, and on the morning of the resurrection He said, "I am not yet ascended to My Father." John 20:17. 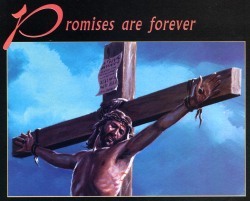 But on the day of the crucifixion, the day of apparent defeat and darkness, the promise was given. "Today" while dying upon the cross as a malefactor, Christ assures the poor sinner, Thou shalt be with Me in Paradise. "They shall be mine, saith the Lord, in that day when I make up my jewels." Malachi 3:17. To serve the Lord is one of the most rewarding experiences that one can have. God classes His people as His jewels--their service to humanity brings honor and glory to His name. A true, lovable Christian is the most powerful argument that can be advanced in favor of Gible truth. Such a person is Chrit's representative. His life is the most convincing evidence that can be born to the power of divine grace. He honours his profession of faith. The world needs evidences of sincere Christianity. Try to imagine what it would be like to be among those whom God says are His jewels. What a thought! Why not allow God to make that thought a reality? As jewels sparkle in the light, so shall the lives of those who have chosen God Himself as their instructor. Dear Friend, this can be your experience if you believe and co-operate with Him. "The meek shall inherit the earth; and shall delight themselves in the abundance of peace." Psalm 37:11. Meekness does not mean weakness. To see the needs of others and quietly share all that you have to make their situation in life a little easier is the meekness that God will recognize. Find time to comfort some other heart to bless with a kind, cheering word--someone who is struggling with temptation or maybe with affliction. In this blessing another with cheering, hopeful words, pointing him to the Burden Bearer, you may unexpectedly find peace, happiness, and consolation yourself. To have the blessing of the Lord is to be highly favored. The lowliest service done for Jesus is the greatest honor mortals can enjoy. God is waiting to bless you, dear friend--He's waiting to share eternity with you. The most exalted language fails to describe the glory of Heaven; it is yours to enjoy forever if you want to. "Your Heavenly Father knoweth that ye have need of all these things." Matthew 6:32. To spend our time seeking to acquire the temporal things of life can rob us of the joy and happiness that comes from helping others. God reminds us that He knows that we have need of these necessities of life. There is no circumstance that comes to us that He is not aware of. He knows our situation well. Through the goodness of God we have been surrounded with innumerable blessings. The things of nature express God's love for His creation, and it is He sho supplies our daily needs. Our minds should go up in gratitude and adoration to the giver of every good and perfect gift. Take time to observe the things of nature--the flowers, the trees, everything that tells us that God is a lover of the beautiful. As we contemplate the lessons which God designed we should, will He not much more care for you whom He created in His own image? All is terror and confusion. The priest is about to slay the victim; but the knife drops from his nerveless hand, and the lamb escapes. Type has met antitype in the death of God's Son. The great sacrifice has been made. The way into the holiest is laid open. A new and living way is prepared for all. No longer need sinful, sorrowing humanity await the coming of the high priest. Henceforth the Saviour was to officiate as priest and advocate in the heaven of heavens. It was as if a living voice had spoken to the worshipers: There is now an end to all sacrifices and offerings for sin. The Son of God is come according to His word, "Lo, I come (in the volume of the Book it is written of Me,) to do Thy will, O God." "By His own blood" He entereth "in once into the holy place, having obtained eternal redemption for us." Heb. 10:7; 9:12. Only by the expensive offering made upon the cross of Calvary can we understand the value of the human soul. 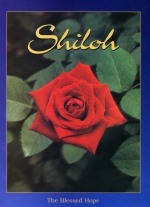 Note: The "Shiloh" magazine in printed form is 16 pages, approx. 6.5" x 9".